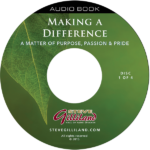 In MAKING A DIFFERENCE, author Steve Gilliland brilliantly lays out three manageable means that make it possible for every person to unlock their potential and exert profound influence. Filled with inspirational anecdotes, laugh-out-loud humor and thought-provoking ideas, this audio book is an eye-opening journey that when put into practice, will make a considerable impact in your professional and personal life. As a master storyteller, Steve expounds on the essentials towards Making a Difference – Purpose, Passion and Pride. Where you live, the money you possess, the money you stand to inherit, your marriage, the car you drive and the friends you appear to have are outward signs of success and not necessarily indicators of inner fulfillment. The amount we earn or the success we achieve produces emptiness unless it is in line with a purpose beyond ourselves. 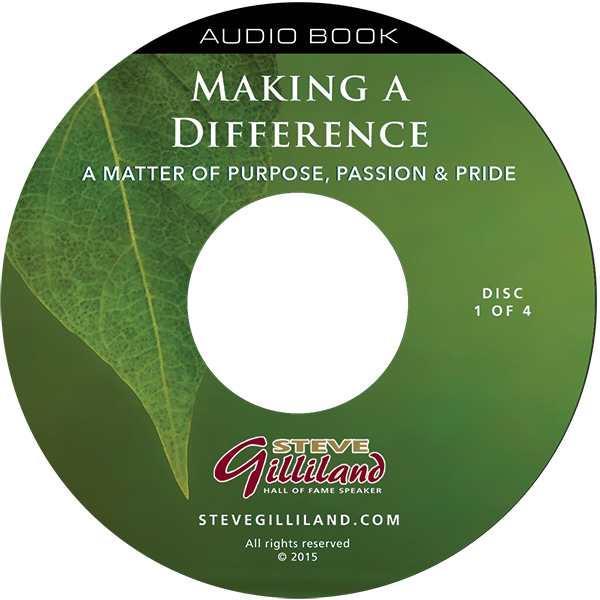 This audio book demonstrates that you don’t need a master’s degree or a doctorate to make the world a better place. MAKING A DIFFERENCE confirms that purpose is the essential ingredient to motivation and the ultimate path to making a difference; passion is what allows us to overcome challenges and disregard people who try to extend their misfortunes and negative outlook to you; and pride is about you and your expectations. It is about realizing the importance of your role in life and taking pride in everything you do! This audio book is a profound idea that will impact your life. If any group or company is looking to engage their people, motivate their teams, and transform their organization, I would encourage them to read Steve Gilliland's book. His message on purpose, passion and pride is resonating and prevailing. Steve drives home the message of the importance of being purpose-driven and passionate about what you do. His observational skills, insight and life experiences are powerful, yet personal. 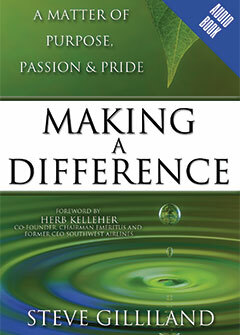 This is a must-read book for everyone aspiring to make a difference! Witty, instructive, entertaining, educational, awesome and refreshing! © 2019 Steve Gilliland, Inc.